This card was made for the Flutter By Wednesday challenge. The challenge this week was an open challenge - anything goes as long as the card included a butterfly, fairy, or angel. 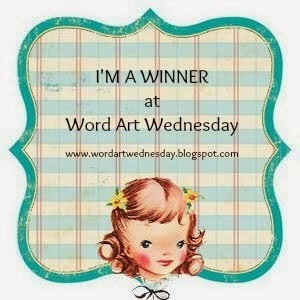 Well, just lookie at what image Paulette at Create with TLC, decided to so generously give away this week! As soon as I saw it, I thought FLUTTER BY!!! How did I do it? Well, I first printed and heat set the image and sentiment. Next was coloring with my colored pencils and loms. After the coloring was completely done, I scored diagonal lines only up to and around the image parts, leaving the image flat. I went back over the score lines using the large end of my scoring tool to get very deep and wide lines. Note: I didn't try to make my lines even, preferring some a bit narrower, and some a bit wider... Next, I distressed with Tim Holtz Antique Linen Distress Ink, using the direct to paper method until it looked shabby and old. Last, I covered the entire image with Versamark and Clear UTEE, and heat embossed. Hope you like it! It looks like another dreary, threat of rain, kind of day here in Missouri! A good day to stay in and craft! This morning, I have a card to show that I made using one of my newest stamps. 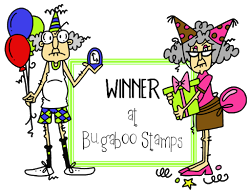 Last month, I won a challenge that was sponsored by Paper Jewels Stamps. I got to spend a little money! One of the stamps that I won from Jenny at Paper Jewels was this darling C.C. Designs Swiss Pixie, Nora on a Swing. I have just been itching to ink her up! Isn't she a doll? SO cute!!! Thanks Jenny for your generosity! Thanks for dropping by! Have a great Wednesday! Ain't I a Stinker? How cute is that! This sentiment is one of Paulette's digi's over at Create with TLC. When it popped up on her blog the other day, all I could think of was this darling skunk from The Angel Company. The raindrops and umbrella were covered with a thin layer of Glossy Accents, and all coloring was done with Tombow Markers. The DP is from TAC. Be sure to check out Paulette's store! It's full of treasures! I am so frustrated! I found out early this morning that Gina K. was having tryouts for a guest DT spot. She asked that we showcase our favorite of her technique videos. I immediately made this card. However, I've tried for all day to get this to post - Blogger problems, etc! So, now I'm late! lol.... my luck! As you can see, my favorite of Gina's techniques is coloring with bleach! The entire card is heat embossed with gold. I've bleached the poinsettia's and the bows on the tree. Added some sparklies and gold pearls. 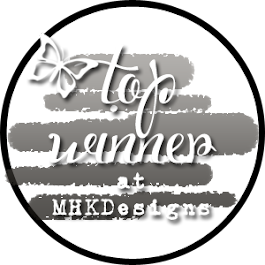 Stamps are Gina K. Designs, by Melanie Muenchinger, and Theresa Momber. Happy Sunday! We spent our first night in the camper last night. DD and her boyfriend came out and BBQ'd with us, and we had a nice evening. Sleeping was a bit different for me, but I think it will all work a bit better each time we use the camper. We're so excited about getting to spend a bit more time together! Hope your weekend was a good one too! Well! 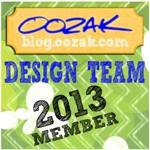 Suzanne Kleczar from "Just Love Stamping" is going to be starting up a new challenge blog. No digi's - all 'real' stamping - ink and rubber! The new challenge site will be called, "Let's Ink It Up". She's put out a DT call, and is looking for six DT members, so if you are interested in being on her brand new DT, give it a try! You have until August 8th!!! My post today is for her DT call. She's asked for our three best cards. 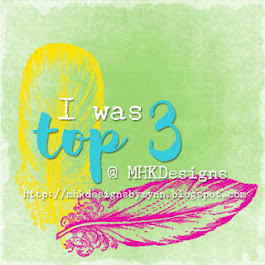 I'm not sure these would be my three best, but they are three of my personal favorites. I'm going to take a chance and enter these three. Have a great night - see you next week! Quick post - busy day today! We are picking up our camper, and setting it up locally tonight to get the feel of everything. Will take pics! Have you ever had one of those cards that work so well in your mind, but when you put them on cardstock, you end up laughing at your efforts? Tee hee...this is one of those type of cards! 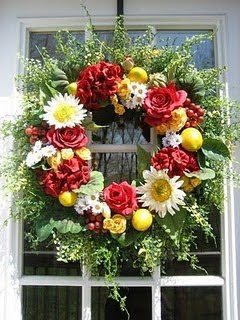 I was using the inspiration photo (above) from The Shabby Tea Room, and decided to try to literally be inspired, and make a window and wreath like the one in the photo. Best laid plans...good idea - not so good, pretty cheese, card! The Shabby Tea Room: "From the Garden"
Pollycraft Challenge Blog: "Happy Birthday"
Stamp Something Challenges: "Something Flowery"
The challenge at Just Rite Stampers this week is "Christmas in July". I love Just Rite Stamp sets, but I only have three sets, and of those three sets, only the half circle is a Christmas stamp. So...I improvised! The doily stamp is Hero Arts, and has been heat embossed with white. The red DP is Martha Stewart, and the green DP is DCWV. The white CS is embossed with my dotted swiss Cuttlebug Folder, so I am also entering this at The Cuttlebug Spot, where the challenge is also Christmas in July. It is rainy and dreary here in Missouri. I left my grout work in the kitchen long enough to come out and make a card! Hope you are finding some crafting time as well. The card above was created for The Pink Elephant Challenge. This week's challenge is a color challenge: Brown. I think this beautiful Cloud 9 Designs DP from my 'stash' works beautifully! 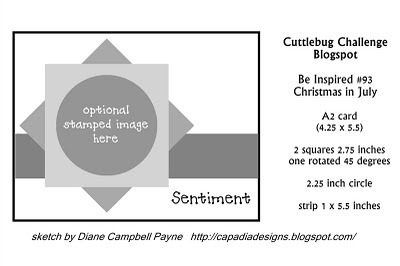 The challenge at Stampin B's Design Team #67 is to: Make your sentiment the focal point. Stamps are also Cloud 9 Designs. Back to my kitchen so I can reward myself later with a bit of crafting and blurfing! The current challenge at ABC Christmas Challenge, is the letter O.
O is for Ornaments, to be exact! The twist was that they wanted some gloss or shine added! Well, dear friends, who can resist gloss and shine? My card is very simple. I matted TAC's Simple Joys (heat embossed with Ranger fine detail silver embossing powder) on red and silver glitter paper. The sentiment is Hero Arts. Ta-da, and Voila! A shiny, happy card! Hope your Tuesday is wonderful. We are up to our eyeballs in paperwork this morning, so must leave you for now! 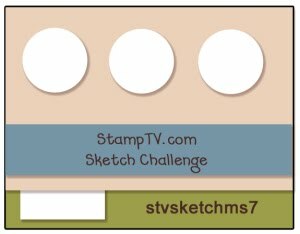 This card is for the Stamp TV Sketch Challenge this week. I used Rupa's "Cuppa Joe" set, from Gina K. Designs. I tried to sorta spotlight the three mugs to resemble the three circles. It didn't turn out like I thought it would, so now I wish I'd just done three circles! Oh, well... that's whey they call them 'challenges', right? The three mugs are colored with colored pencils. The edge punch is by EK Success. Hope your weekend's going well! Had a good time today at my friend, Shirley's - she's a TAC Angel, and had her Christmas in July open house today! Christmas music, Christmas Cookie with red and green icing, Christmas rug greeting us at the front door - she rocks! Have a great weekend - Patti J. This fun sweet image is from Lili of the Valley. When I saw that the ABC Challenge was "You and Me", I thought of this stamp immediately! I embossed with silver Zing Embossing Powder, and colored with my pencils and loms. The DP is Stampin'Up. Hope these little sweeties bring a smile to your face! we could make whatever we desired, as long as it contained a butterfly, angel, or fairy, and included at least three layers. 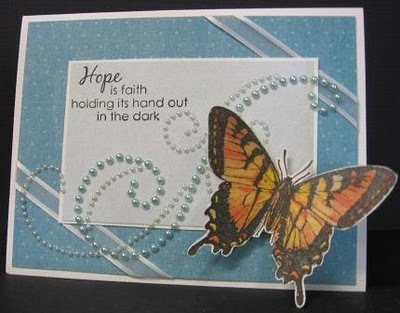 This card features some more of Paulette's amazing work over at Create with TLC. The lion, and the sentiment were both freebies on her site. If you haven't checked out her website, hurry over and do so! All coloring was done with my colored pencils and loms. Butterfly punch is Martha Stewart. CS is Bazzill. Why do people recite at a play, and play at a recital? Park in a driveway and drive on a parkway? Have noses that run, and feet that smell? and in which an alarm goes off by going on! So, Christmas in July seemed to be the challenge choice of many this week! This card features a retired TAC set, "Tropical Snowmen". I couldn't think of anything more fitting than a bikini clad snowlady for a July Christmas theme! Hope she makes you giggle - cheeks are colored with Tombow markers, bikini and hat are paper pieced. I inked up this little guy, just thinking I needed something to color. I wasn't really worried about challenges, but I found some that he'll work for! Stamps are The Angel Company, and coloring is pencils and min. spirits. Thanks for stopping by - hope you like him! ...DH and I bought a 32' camper yesterday! Wahoo! Hopefully, when he has to travel, we can travel together now. We are looking forward to spending some quality time together. Life is just too short for us not to spend as much time as possible together! We have to get a 5th wheel hitch put on our truck, have the brakes checked out, etc., so it will be maybe 1.5 weeks before we are ready to boogie! We are very excited! I have a couple of fun cards to show today. The first card is for the color challenge this week at Stamp TV...yellow and green. I've chosen to use the free downloadable green and yellow papers from Stamp TV, and Theresa Momber's oh so fun set, "Hang in There". All coloring is with pencils and LOMS. Don't you just love this little frog? This next card was a birthday card for dear BIL. He turned 62 yesterday. The stamps are from Skipping Stones, and I think this set is just too cute. There are other sentiments included, so you will be seeing it here again! The fun hand is from a set by Pink Paislee, 365 Degrees, that I won in Stephanie Castro's fabulous blog candy last month! You will also be seeing more of these stamps - they are wonderful! We also got one more row of tiles up on the wall last night - slowly but surely! Ugh...but I ate pizza. BIG honkin' slices of supreme pizza - TWO of them. Sigh.... but I've done better again today! And I'm not weighing here anymore at all - I'll do that only at W.Watchers on Thurs. nights. The picture above is terrible, but it gives you an idea of what we are doing on the backsplashes. That's all I have today! Hope your Tuesday is wonderful, and that you are finding lots of crafting time. I have some painting to do in the kitchen tomorrow, but will be back at some point in the day to check on all of you! Why do they call it a running back, when he is running forward??? The One Layer Wednesday challenge at Simplicity last week, was to make Susan laugh. Last week was a very long week for Susan and her family. Their long time pet died last week after battling cancer. After many tears, Susan's challenge to all of us was to make her laugh. That was a tough one, but here is what I came up with. Susan, if the image doesn't make you laugh, just think of it as ME after my daily 2-minute workout! Actually, this old gal looks BETTER than me after a 2 minute workout!!! Stamps are by Rubbernecker - got them in Collinsville last month! Coloring is done with Tombow Markers. Hope she gives you all a chuckle - Patti J. These are the favors I made for the little guy having a 1st birthday. His party was today! His momma filled the bags with M & M's and Animal Crackers. It was a fun day! Now...we interrupt Show and Tell to bring you Official Business!!!!! It's Monday, and time for Challenge #3 at Iris. The challenge this week was 'no patterned paper'. 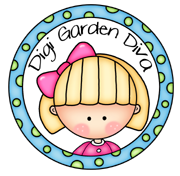 I used some of Paulette's fabulous free digi's at Create with TLC, and this is what I came up with. I wanted this to have an older feel, so I cut it into small pieces, inked around them all with Old Linen Tim Holtz Distress Ink, and then inked over the entire image when colored (pencils and LOMS). Have a great week! Hugs -Patti J. Why are boxing rings square??? Edited: At the end of week one, I am only down .4 lbs. They assured me that at this point I am bloated with water weight, etc., and am beginning to work my muscles, etc., and that it WILL come off. It better! lol...thanks for your support! I've had this NOEL stamp (Great Impressions) since I began stamping. I actually think it was my first store purchase. When the ABC Christmas Challenge had a NOEL challenge, for the letter N, I jumped at the chance to ink this baby up! I used Judikins Egyptian Gold Embossing Powder, and colored the letters and holly leaves with Tombow Markers. Easy Peasy! Thanks for looking! Next, I want to show you what I did for some family friends who just purchased a home. I made the 'house', but I wanted to use the card as a Congrats for new home AND a thank you. So...I made the roof come off the house. That's where the congrats note is written. TAC's Happy Thoughts set is on the bottom of the 'tag'. The photo above is the complete card. The photo above shows that the red card is A-2 size, and opens normally for a thanks note to be written. The photo above shows the roof being raised for the congrats tag. This photo shows that the tag is actually folded, so that the writing is on the inside. I hope the kids like this card. I thought it turned out cute. Well, happy Thursday, one and all. I need to go take care of a few chores before heading into town to weigh in. Why are the buttons on a man's shirt different from the buttons on a woman's shirt? Here's hoping that your Wednesday is off to a great start! I've done a little bit of floor sealing, and a little bit of crafting, and a LOT of coffee drinking so far this morning. Today's card features one of The Angel Company's new sets. A few weeks ago, when my back was 'out', my dear friend, Shirley gave this to me as a get well gift - it worked! I'm well!!! I made it primarily with Flutterby Wednesday Challenge in mind. The gals have taken a summer break, and today is their first day back. Woot woot! They have been missed!!! Today's challenge is an open challenge - just include a butterfly, angel, or fairy on your project! This card was very simple. I simply stamped the three images with Versafine Brown Ink, then masked them off and sponged the 'stripe' with Tim Holtz' Weathered Wood Distress Ink. I really wanted to bling it up, but it needed to be CAS, so I took a deep breath and stopped! I've received a few emails asking me where my "food for thought" has gone! To be honest, it seems like I'm always posting in a hurry, and just don't think about it. I will try to be better! I like it when my peeps are smiling! Did you know...If a statue in the park of a person on a horse has both front legs in the air, that person died in battle. If the horse has one front leg in the air, the person died as a result of wounds received in battle. If the horse has all four legs on the ground, the person died of natural causes. Wow. Where have the last five days gone? It seemed I'd just posted yesterday. When I looked at my last post, it was from Thursday! Time flies when you're having fun! We gained a bit more headway in the kitchen this weekend, but only we can see it. Someone walking in off the street would shudder, turn around, and leave. However! We did get the stove and refrigerator out of the dining room - success!!! DD had a bit of a scare on the 4th. She'd come here to visit, and was driving home. Suddenly, her car was hit by someones fireworks! She couldn't find any damage to the car, but it sure startled her! This picture was taken on the 3rd, when she went berry picking. 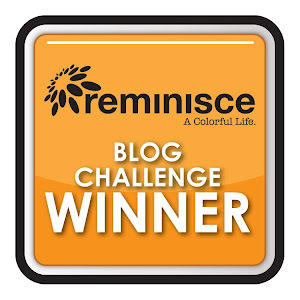 Check out her blog for more berry picking pictures! 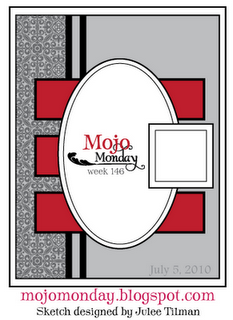 Today's card features the sketch this week at Mojo Monday, and uses a darling Elizabeth Bell image, and TAC sentiment. I was in need of a get well card for a friend who had a hip replacement, and I thought she'd bring a smile! Coloring is with colored pencils and loms. So glad that you stopped by today. I hope that if my card didn't make you smile, that DD did! Have a great week! I should be back tomorrow with some more finished projects! Today, I have a card made with one of Paulette's Create with TLC images. It is a very simple, one layer card. I printed the image directly onto Kraft stock, did a little coloring with my colored pencils (sorry folks, no Copics), tied a piece of ribbon around it, and matted it onto red cardstock. For an added touch, I have some of these little rusted stars that I adhered to the ribbon. Voila!!! 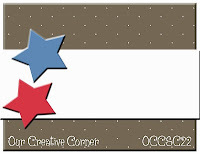 Gosh, don't you just get all warm and fuzzy when you make an easy peasy card that looks like it took all day??? lol...Paulette, you rock! On a personal and quite serious note, I am starting on a journey, and am hoping that you will follow along with me, and encourage me along the way. Tonight, I am signing up for Weight Watchers. It's long overdue, and my DD reminded me the other night that she wants to keep me around for a while. So...after each weigh in, I will report to you. My goal is to lose 70 pounds. I would love to lose 90, but at this point in my life, it's probably not feasible. I would love it if you would help keep me motivated. If I report a loss, celebrate with me. If I gain, please encourage me to hang in there and stick with it. Most of all, pray for me to have the strength and willpower to do this. If anyone knows of a widgit I can put on my blog to keep track, please email me!!! Thanks for stopping by today, and hope you like this and run over to Create with TLC and nab yourself one - it was a freebie! While you're there, check out her store - do a little shopping!! !